Red, white and blue covered the perimeter of the Veterans Memorial Park in Laguna Vista Saturday, Nov. 11 as residents gathered together to celebrate those who have served in the Armed Forces during the Town’s annual Veteran’s Day celebration. 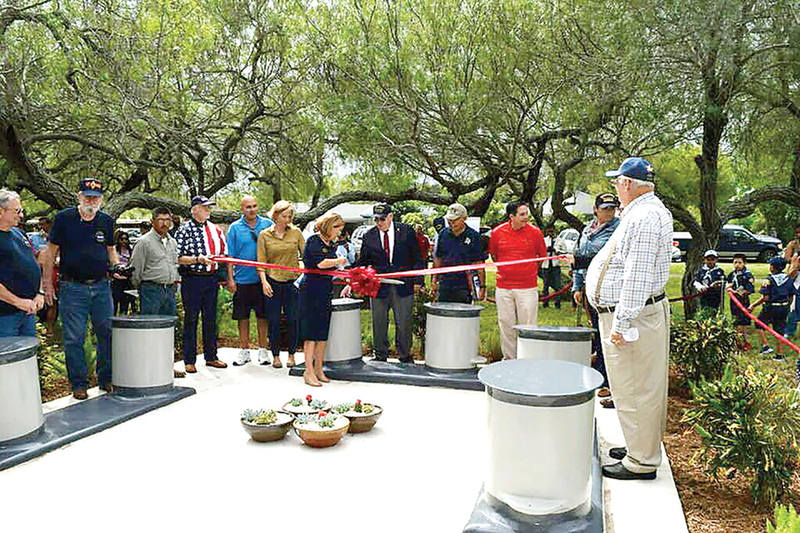 Laguna Vista Mayor Susie Houston and local residents also had the privilege of welcoming a special group of visiting veterans to the park as the City unveiled its new Aircraft Carrier Memorial. The memorial features bollards from the USS Constellation, USS Independence and the USS Ranger. The bollards, which originally served as means to secure the ships to pier, were removed from the vessels as part of the dismantling process they have been undergoing by International Shipbreaking Ltd. at the Port of Brownsville. The Town invited several veterans who had served aboard the ships to come to Laguna Vista and be recognized at the new memorial’s unveiling. “It is an honor for me to be here for the ribbon cutting of such a special monument and addition to our community. I am proud to stand alongside all of you as we welcome the individuals who served aboard these carriers,” Mayor Houston said.